After 2 long runs of 32 kilometers, and 2 long runs of 34 kilometers, last Sunday was to be my longest run. After that in the bag, I was looking forward to the camaraderie of some shorter runs with friends during the last 3 weeks that led up to Marathon Day on October 19th in Toronto. My ultimate goal for my longest run was to finish STRONG, and get myself mentally pumped for the big day. After coming off a wonderful 16k run the day before with a friend, I was pumped. I asked my dear wife if I could borrow her “Smart Phone” with that runner’s app (used it the day before, but my friend ended up turning it off for me, after I couldn’t). That day, I was going to master that phone as well and FINISH STRONG, but Lynne mentioned the phone was not available for 2 more hours, as it was charging. 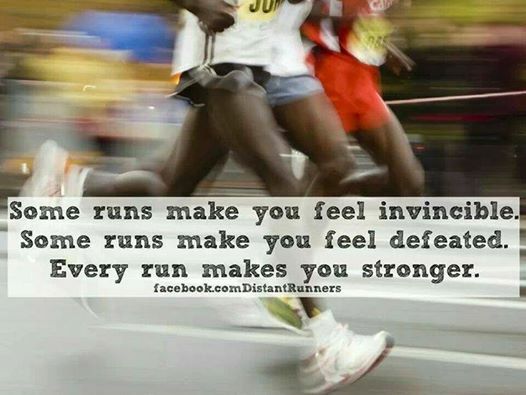 Oh well, it just back to me, myself, and my thoughts, which I do really enjoy while running. To get my distances I would need a reference point at the beginning, a reference point at the end, and then go to Google Map on my home computer to compute how far I travelled. The signage is posted at every road entrance. NO MOTORIZED VEHICLES! 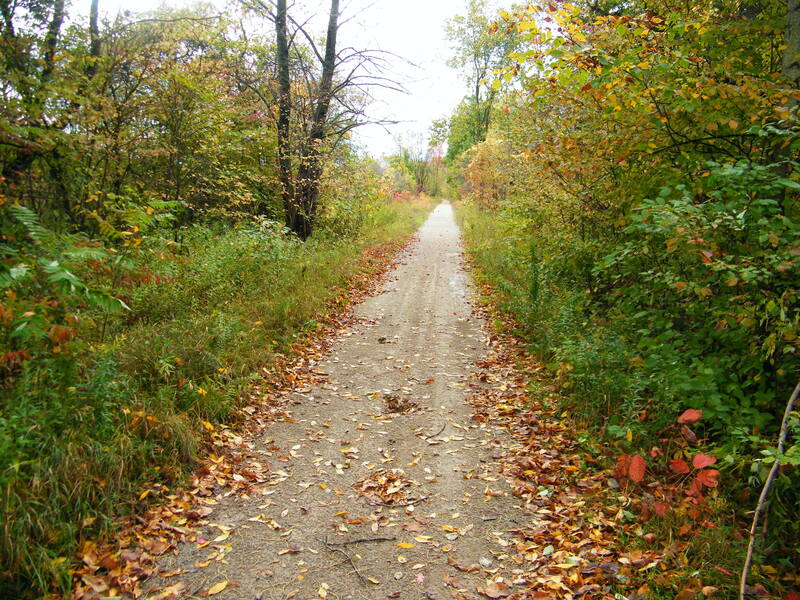 As always, my long runs were on the North Simcoe Rail Trail. No automobiles, and in fact, no motorized vehicles are allowed whatsoever. It was a beautiful fall day. 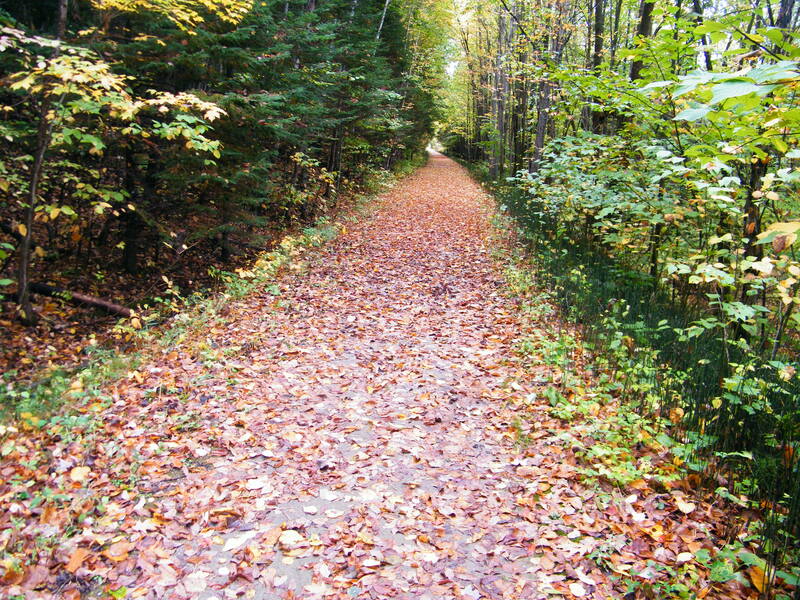 The leaves were changing colours and in the forested areas, they were starting to leave a magical carpet on the trail. There was a real connection with the rhythms of my body, my breathing, and my surroundings. I was running very, very strong. It was wonderful to see so many people out enjoying the day and the trail. Young couples holding hands, larger groups of up to 8 people, cyclists, fellow runners, and young families with toddlers that were allowed the freedom to run at will and explore. It made me smile, and was very precious to see. I had no idea what my times were, but it seemed like this was indeed the run of my life. In no time at all, I had reached the spot where the lady on the smart phone told me 17 k the previous week. My goal was to keep going to the next road, so I could reference it for my distances. But to my shock, less than a kilometer away, the trail abruptly ended, right in the middle of nowhere, with not a road in sight. This was a challenge, and an obstacle I was not prepared for, and it knocked the wind out of me. Being very careful not to roll an ankle, or twist a knee, I made my way to what was to be Sunnidale Road, and then back to where the trail abruptly ended. It was tough going, and the approximately 3k of “off trail” running knocked all the momentum out of me. 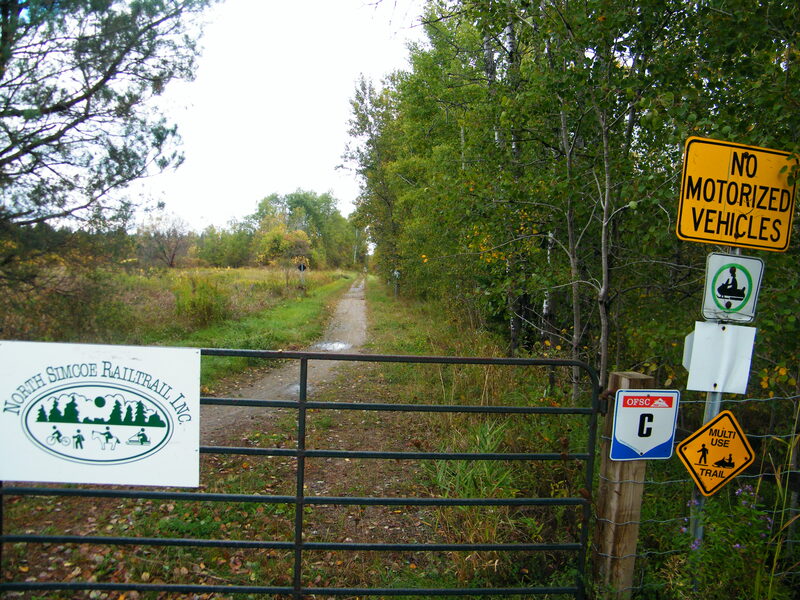 Sign announcing “The End of the Trail”. 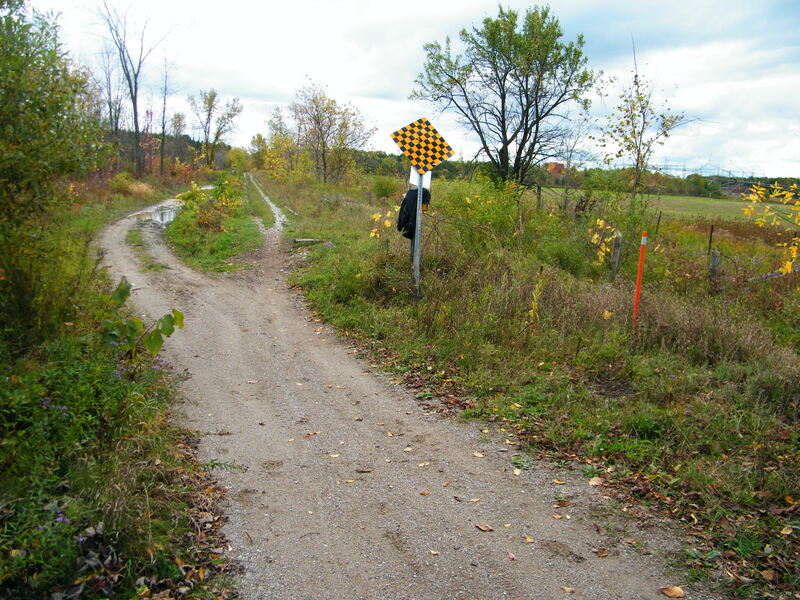 I ended up keeping to the right , as the left ended up being all mud bogs. “Okay Carl, shake it off, get yourself together, you can still finish this strong”, I told myself, and started back running. After I was running for a bit, I heard a motorbike in the distance shattering the silence and solitude. Thinking at 1st it was on the next road ahead, or was it? Surely it can’t be on the trail with so many people using it today. But it was, a high powered motocross racing bike, which was now coming towards me very, very fast. I made a motion with my arm to slow down, but the motorbike rider took exception to this. He dropped a gear, and then immediately started revving the engine to screaming levels, adding a gear and then another. He was a blur coming towards me, as I was scrambling off the trail and diving into the vegetation, he edged his motorbike right over the area where I stood a split second before. The biker slowed after it went past me, my fear was he was going to turn around and come at me again. But he did keep going, and I did not move until his sound was completely out of range. This is around the spot where the high powered motorbike was coming at me. I was numb, shaking, and when I tried to stand, I had to brace myself to keep from collapsing. Believe me, there is nothing found anywhere in the marathon training manuals about this. This was a first. Eventually I got back on the trail and started walking, 10, maybe 15 minutes, I don’t know, but knew this remaining run about 16k needed to be finished. It was not pretty, every step of my remaining run was very mechanical, and what seemed like an eternity, I completed “my long run” back to Phelpston, totally physically and emotionally drained, total distance of 38.6 kilometers. It has taken a while to collect my thoughts after that day. At 1st, I was so numb I could not write, then it was anger (not really the frame of mind to write). I am now more concerned for this rider, there really has to be an underlying reason why he reacted the way he did. In order to finish this day strong, and not let it defeat me, I have had to come to the place to forgive in my heart and move on. Just glad no one was seriously hurt or killed. There has been more “setbacks” since that wild and crazy “long run” a week ago, but that will be in another blog. Thanks for reading. It has been therapeutic for me to EVENTUALLY write this out. so at the end you finished strong, anyway!! It put a smile on my face to see you dropped in CC, thank you for reading and your kind comments. 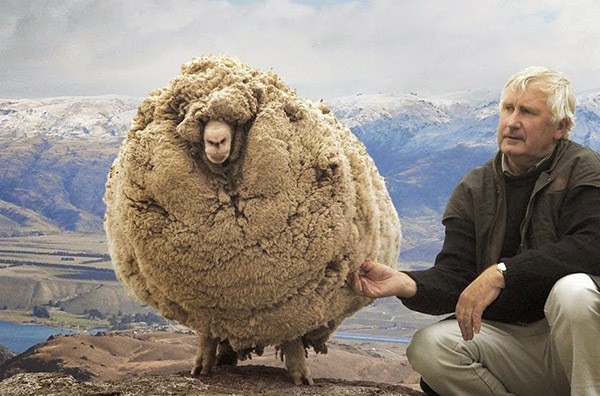 I have spotted some e-mail notifications of new posts from you, and I am hoping to drop in later today. Thank you for your final 2 words of your comment. I am being very careful and resting. The rest of the WP world will know in my next blog. Beautiful photos! Looks very familiar 🙂 I’m glad this experience hasn’t kept you from running the trail and glad that you were able to act fast, get to safety and still finish your run strong. Thanks for sharing! Once I get some pictures organized, there will be a blog post about it within a day or two. As to the motorcycle rider, I am guessing that he is one of those people who believe that rules don’t apply to him. That is very scary though. Suzanne, am sure you could much more than 20 metres, but thank you! 🙂 I did end up walking for 1 or 2 kilometers after that motorcycle incident though….lol But it did feel good, particularly a couple of days later, as my mind cleared and it all sunk in. Ashley, I am sincerely sorry to read about your accident. Ashley, thank you so much for the nomination for “one lovely blog award. I am very touched and honoured. Having been presented with same award a month ago, I will pass. But THANK YOU!! God bless, and may you heal quickly. People reflect the best and sadly the worst in life. Why someone would choose to do that to a runner begs believe. Wishing you a speedy recovery Carl. And WOW, this is SO cool that you are familiar with this area. Hopefully in a place and time we will be able to connect in person! Perhaps the run in Toronto! ?